Nichols is right that the subtext of Charlie Wilson’s War is sure to affect all news savvy audience members who see his latest film but instead of his War falling flat on its face the way that box office bombs Rendition, Lions for Lambs or In the Valley of Elah did despite critical praise, Nichols makes sure we’re thoroughly entertained. In addition, Charlie Wilson's War has picked up unprecedented momentum with its end of the year release that I suspect will only increase during award’s season. Although most of the publicity stills and press fixate on the mega-watt smile of the gorgeous Julia Roberts and America’s favorite good guy Tom Hanks, Charlie Wilson’s War belongs to supporting player Philip Seymour Hoffman who commands our attention within seconds of his first scene as his CIA rogue officer Gust Avrakotos yells at a helpless John Slattery before proceeding to break the window to his office for the second time. It’s loud, it’s angry, it’s shockingly funny and it’s pure “Phil Ham and Cheese” as writer/director Paul Thomas Anderson called the actor in his film Magnolia; in other words, we eat it right up and can barely wait for seconds. Nichols’s film, penned by scribe Aaron Sorkin, the mastermind of the critically lauded West Wing and unfairly canceled Studio 60 on the Sunset Strip, is based on the nonfiction book by 60 Minutes’ George Crile that centered on unlikely alcohol drinking ladies man Democratic Texas congressman Charlie Wilson (Hanks) who, along with rich religious right poster girl millionaire Joanne Herring (Roberts) and Agent Avrakotos (Hoffman) manages to help fund the covert war in Afghanistan for the rebels to overthrow the communist Soviets who have been invading and bombing their region. Of course, as we now know in 2007 with the gift of hindsight, their actions have as IMDb notes “far-reaching effects,” with the Afghanistan citizens being inundated by Taliban forces after the war which resulted in the horrific circumstances leading to both 9/11 and the wars we’re fighting today. However, as a purely entertaining and fascinating look at the cold war era, Nichols’ film is richly deserving of its five Golden Globe nominations and will hopefully not get lost in the shuffle of big studio holiday releases. 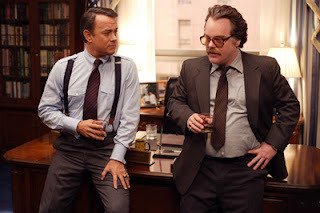 Although it won’t end up on many top ten lists, Charlie Wilson’s War is quintessential Nichols and Sorkin and worth a look to see an effectively against-type Hanks and Roberts and the always mesmerizing Hoffman in one of 2007’s most memorable performances.